Del Toro: Hellboy 3 Would Take "The Mother Of All Kickstarters"
There's a simple reason why Guillermo del Toro hasn't yet made Hellboy 3: It's too expensive. I didn't personally care for it, but the Hellboy flick and its sequel, Hellboy II: The Golden Army, were reasonably successful and popular films. 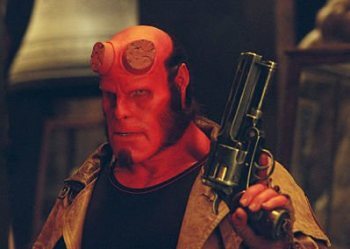 Given the film industry's affection for sequels and franchises, not to mention the fact that Hellboy II came out in 2008, you might then reasonably wonder why we haven't seen or heard anything about Hellboy 3. As it turns out, it's just too expensive. Inflation in Hollywood must be terrible, because del Toro said the budget for the third film would be almost triple that of the first, and nobody's interested in footing that kind of bill. "A couple of weeks ago or months ago, I did make a couple of phone calls to test, to gauge the possibility of doing that because it's a big movie," he told Latino Review. "There's no takers for a movie of that size. The two movies made their money back and a little bit. They were financially good, but one was $50 [million] and the other one was $80, $85. This is $140. So no one wants to do that leap, from the financial side." And while the generosity of the masses has famously breathed new life into long-dormant game franchises, there's a world of difference between a $2 million indie videogame and a $140 million big-budget Hollywood production, a fact not lost on del Toro. "Unless we find a way to do the mother of all Kickstarters," he said, it's just not going to happen.